Ultra-marathoner Tom McGrath is going to run one marathon per day for 6 days. That is over 150 miles! 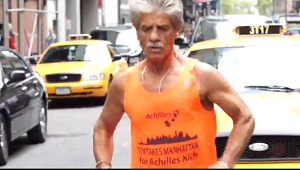 McGrath, the proprietor of The Black Sheep Irish pub & restaurant in Murray Hill, will run from downtown Manhattan to its northern tip and back, each day this week to raise funds for the Achilles Kids program. Achilles will use the funds to buy sneakers for disabled children participating in the program. The run started Monday morning, Sept. 23, on Wall Street and that day’s leg finished at the World Trade Center. The six-day run will end on Saturday, September 28 in Central Park. Some of the Achilles Kids will join him for the last mile or two for an honorary lap around the Reservoir.